Inventory (or warehouse) finance is a form of trade finance in which goods are held in a warehouse for the buyer, usually by the seller (but could be by a third-party), until needed. This is a typical supply chain finance instrument for qualifying commodities and products. The funding institution (FI) provides flexible warehouse and inventory financing facilities to accommodate transaction flows. Using securely stored goods as collateral, allows companies to obtain financing by depositing the inventory in a qualified third-party warehouse usually managed by a collateral manager. 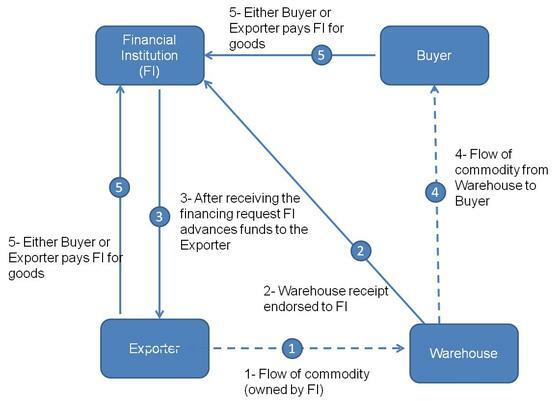 The diagram illustrates an example of the inventory finance instrument for supply chain finance. A processor and exporter of food commodities seeks to finance its exports to major food service companies and obtains financing from an FI by pledging inventory of raw and processed goods. The FI extends a facility which is repaid in a number of equal monthly installments with a bullet payment at the end of the repayment period. Payments are received through assigned contracts from acceptable off takers. The inventory pledged to the FI is stored in a certified warehouse, monitored by a reputable third-party collateral management company, and released only when FI is repaid directly by the off takers. The financial institution is issued monthly inventory inspection certificates by the collateral management company to ensure that the facility is fully collateralized.